Tax the rich. Stop transit cuts. Stop the war. For marchers on this Martin Luther King holiday, it was pick your protest. More than 100 people took to the streets of Chicago Monday to make their voices heard on a number of topics ranging from gay rights to transportation funding. The idea that binds them together: more money needs to be spent on public services. "Enough is enough," said event organizer Joleen Kirshenmen. "We need to start investing our money in things that matter instead of wasting it on corporate bailouts." 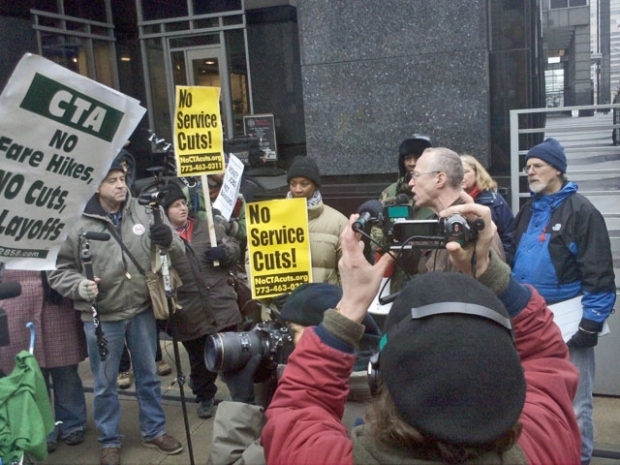 The march comes in advance of a reduction in Chicago Transit Authority service, which is set to take effect next month. TransitChicago.com has a detailed list of all the bus and rail service changes. Over 1,000 bus drivers are being threatened with layoffs. CTA service cuts will affect 18 percent of bus service and 9 percent of train service, mostly in working and poor communities. 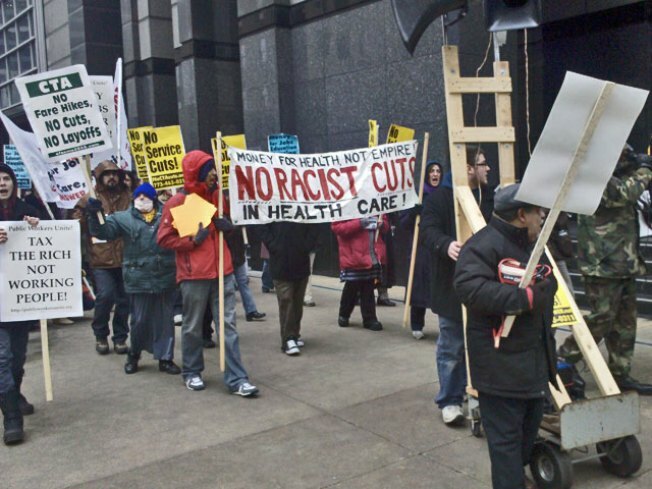 The peaceful march made its way from CTA headquarters to Boeing headquarters end at the Thompson Center with a rally. The protest was organized by Public Workers Unite! and endorsed by NoCTAcuts.org, AFSCME Local 2858, Caucus of Rank & File Educators, Jobs with Justice, Little Village Environmental Justice Organization, ANSWER Chicago, Socialist Alternative, the Party for Socialism and Liberation and Solidarity.